Situated near the beach, this cabin is 0.4 mi (0.7 km) from Penguin Point. Situated in Warrenben, this vacation home is 10.4 mi (16.7 km) from Penguin Point. Unfortunately, we don't currently have hotels in Marion Bay. About 80 kilometres from Marion Bay is Wool Bay, which has a number of places to stay. Start with the Oysta La Vista and Stansbury Holiday Motel. Keen on discovering more of what makes the South Australia region so special? Why don't you spend some extra time in some of the other parts of South Australia? Enjoy hiking and four-wheel driving, visit local attractions, or just take it easy and enjoy the beaches, rolling hills and desert landscapes. Wotif has the perfect hotel for you. Wotif will take you to Marion Bay, on budget, on time and in style. So grab your suitcase and start packing! How Much is a Hotel Room in Marion Bay? 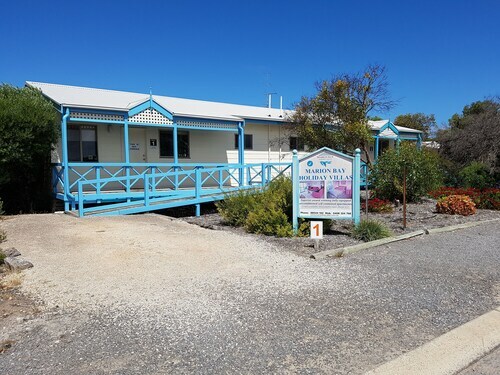 Hotels in Marion Bay start at per night. Prices and availability subject to change. Additional terms may apply. It was a good stay. We were surprised with what we got with what we payed in a good way. Everything was clean and in good condition. The only negative thing is that we could hear the people next door who we were sharing our wall with. We will be back again with the kids hopefully next year.